Competitive Edge Products, Inc is pleased to offer the fantastic Tanita D-1000 Remote Tabletop Display work for BC-1000. The D-1000 Remote Display provides 9 functions from one scale! Aside from weight, this scale also measures Body Fat %, Body Water %, Muscle Mass, Bone Mass, DCI - Daily Caloric Intake, Metabolic Age, Figure Rating, Visceral Fat. From the comfort of your own home you are able to monitor your health on a daily basis, giving you the ability to make changes on a daily basis, if necessary. The extra large, adjustable, blue back lit, LCD display is easy-to-read. The low profile, wide platform makes use effortless. With a 4 person recall option, the scale will track your health for you, as the whole family can utilize one scale. 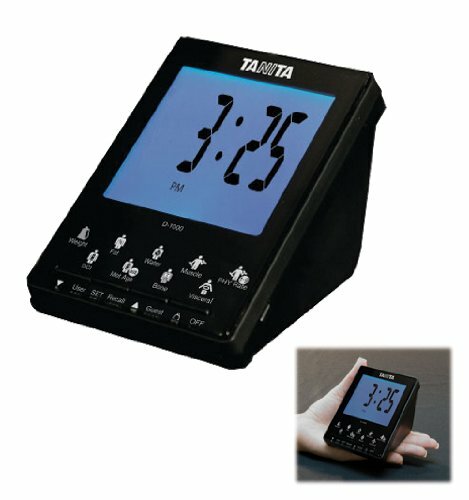 The NEW D-1000 Remote Display from Tanita screens 9 body composition readings wirelessly from your BC-1000 platform. An indication light brightens the matching icon (weight, Body Fat %, Body Water %, Muscle Mass, Bone Mass, DCI - Daily Caloric Intake, Metabolic Age, Figure Rating, Visceral Fat) for each dimension as it is shown on the extra-large LCD display with blue backlight. Stores individual information for up to 4 users and functions as a clock when not in use. Inbuilt stand for upright viewing, and push button indications consist of: up and down arrows, individual, set, recall, guest, weight only, and on / off.